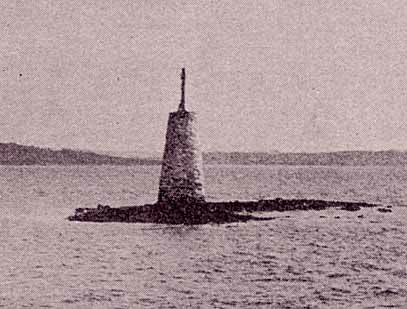 In 1866 a granite daybeacon was built on the shoal off Conimicut Point. It was converted to a lighthouse in 1868. I could not find any photographs or drawings of the daybeacon or the 1868 Conimicut lighthouse. The photograph below, another daybeacon in Narragansett Bay, gives you an idea of what the Conimicut Point daybeacon may have looked like before it was converted to a lighthouse.